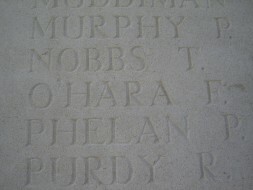 Pozieres Memorial, Pozieres, Somme, France. Francis was born near Edgeworthstown, likely at Ringowny/Ringonna on the 17/3/1889; he was the third son of Francis and Anne O'Hara. By 1911 Francis was no longer resident in Longford. 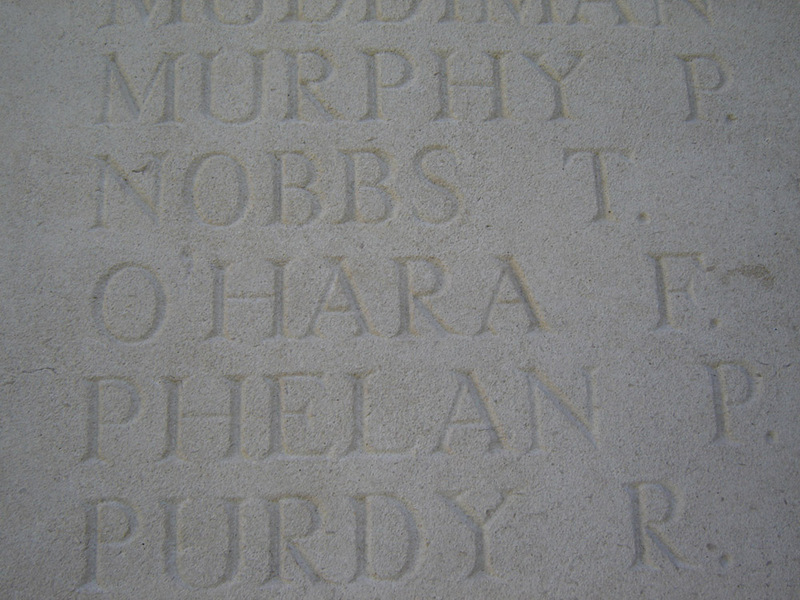 Private O'Hara and enlisted in Longford and entered the war in France on the 19/12/1914, for which he earned the 1914-15 medal. This early enlistment suggests that he may have been either a serving soldier (likely with the 1st Leinsters who were at Faizabad in India until October 1914 and landed at the front on the 20 December 1914); alternatively he may have been a reservist. Francis was serving with the 2nd Leinsters when they were transferred, on February to the 47th Infantry Brigade under the 16th (Irish) Division, under Gough's Fifth Army. On the 14 March they arrived at Tincourt in the Somme, where they had witnessed such devastation less than two years prior, and then onto Grange Camp where the men celebrated St. Patrick's Day by playing sports. At 4.45am on the 21 March the Battle of St Quentin commenced and the German attack was ferocious. The Leinsters were initially in reserve at Villiers-Faucon, but were ordered to a trench known as the Brown Line that afternoon. Unfortunately, on the morning of the 22nd, their right flank was compromised when the 66th Division retired and Francis's regiment suffered huge casualites, and forcing repeated retreats, eventually to a ridge south-west of Villiers-Faucon, where they remained explosed. The battalion suffered huge losses in this battle.